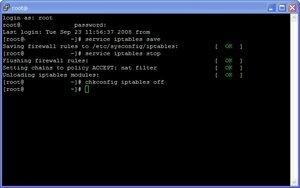 Using a Windows box with Putty to install and execute jboss with it’s own Tomcat instance using the default port of 8080 on a fresh built Red Hat Enterprise Linux box, everything looked to be fully operational; however, I could not access the web address from a remote box. I quickly realized that the firewall was fully operational (from previous experience). I found a great little article that quickly resolved the situation. After executing several commands, I was able to access the jboss web console. Another instance of Putty was opened and executed the following three commands to save and disable the firewall.